The simple answer is that there is no one best search engine, rather, it depends on where you’re going and when you can go and your flexibility in both of these. So, what I’ve done here is compile all the best search engines for finding cheap plane tickets. They are categorized depending on what type of travel resource you’re looking for. It’s essentially an Ultimate List of Cheap Airline Ticket Search Engines. Below I’ve listed the category of travel search engines/websites — for instance, International Travel Search Engines or Domestic Discount Airlines — then I’ve given a brief description of when to use those sites, and then I’ve listed the best sites within that category. For people who frequently search for cheap airline tickets, there are a few sites and tools that may even be new to you — like those in the Market Comparison section. Before you buy a ticket, check out these sites to see average fares, price history, and if prices are rising or falling. Again, check these sites out before you start looking into airfares to get an idea of what you should expect to pay. The best search engines for searching for airline tickets. You don’t book through them, rather they redirect you to the airline’s homepage. This is what makes them different from online travel agencies. When you’re searching for an international ticket, I have found these search engines to be best for finding a cheap airline ticket. And Wotflight.com is a great place to look for cheap flights in Australia. These sites allow you to search for cheap tickets and buy through them. This means that you deal with that company and not the airline if something goes wrong. I generally advocate booking directly with the airline. The online travel agencies may charge ticketing and booking fees for booking through them. If you’re looking for a flight on an upcoming weekend, these sites are best. If you don’t care where you’re going, you just want to go somewhere cheap, these sites list destinations with cheap airline ticket prices. Finding parking at airports is critical to success in finding a cheap plane ticket. Holiday Extras offers low prices and great choice of Luton airport parking – both on-airport and off-airport locations. Suntransfers offers airport transfers between airports and your destination – worldwide. I hope you find this Cheat Sheet useful. Please consider bookmarking it with your favorite bookmarking site, so that everyone can learn how to find a cheap airline ticket. What are your favorite travel search engines? I’m a bit of an airfare search engine geek. I love searching websites and flight aggregators to try to find the cheapest plane ticket possible. As I’ve become more conscious of my environmental impact, this also means searching for nonstop flights. Unfortunately, I’ve found that many websites don’t make this easy. As a green traveler you too should search for nonstop flights, since much of the fuel burned on airplanes occurs during take-off and landing. So, to assist you in your efforts to search for nonstop flights I’ve put together this list of websites that offer 1-click non-top preference buttons on the front page of the sites. On all of these websites you can check a box to indicate that you prefer nonstop flights. For comparison, here are the websites that don’t offer front page no-stop preference buttons. 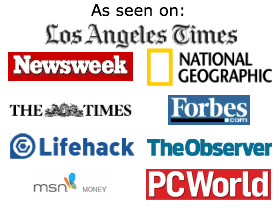 Most of these sites offer nonstop once you’ve done your initial search, but not before. I hope this list saves you time and energy searching for nonstop flights. More importantly, I hope it saves the environment as more people choose to pass up multi-leg flights. When searching for plane tickets, you can save a ton of money by searching with flexible travel dates. 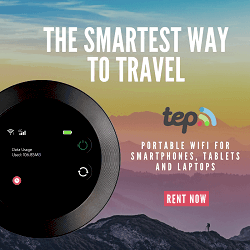 As part of our cheap travel tips series, I’m going to reveal my three favorite search engines for when you have very flexible travel dates. All three of these search engines allow you to search with more than the standard flexible search of 1-3 days around your travel dates. Instead, they allow you to search for flexible travel within the next 330 days. Searching for flexible travel dates can save you literally hundreds of dollars on a flight. For example, if looking at airfare from Washington, DC to San Francisco, if you have flexible travel dates for when to visit you could pay $219 to for a flight in June. But, if your dates aren’t flexible — forcing you to leave a few days earlier or later — you would pay $319 for the cheapest flight. This is how flexibility saves you money. Again, very few travel search engines allow you great flexibility when searching for flights. Usually the “flexible search” option is 1-3 days around your given date, but these search engines allow you the maximum flexibility — 330 days from today. The three best are FareCompare, Kayak, and Travelocity. Kayak’s search function also shows a popup window when you type in your to/from cities. Cons: Kayak’s flexible travel search is based on other’s recent searches– so the results they show aren’t necessarily fares that are still available for you to purchase. 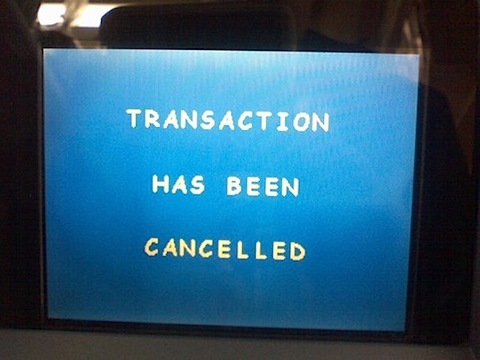 This can be frustrating if you find a great fare, but then it’s no longer available. I like FareCompare the best for flexible travel because it shows you the cheapest dates earliest in the searching process. As soon as you type in your travel to/from airports, the cheapest and most expensive months to travel appear on the right hand side. Then as soon as you click on the departure date, a calendar pops up. It’s fast and easy to follow. Travelocity also has a great flexible travel search option that searches 330 days out. It lists the very cheapest ticket price first (no matter what month it’s in), but I don’t like it as much for three reasons. First, it isn’t laid out in a format that works well for me. I like the calendars that appear on both Kayak and FareCompare. Because if it’s only $3 more to fly on a Friday versus a Thursday, I’m going to pay the extra $3. With Travelocity it’s much harder to see the flexible travel dates that work well with a certain schedule. Second, it takes 4 or 5 times as many clicks to choose your actual flight options — this gets cumbersome. Third, Travelocity don’t include taxes/fees in their results. Giving you an artificially reduced price (until the final screen). Searching for airfare with flexible travel dates will save you tons of money on your next airline ticket. I almost always use Kayak search engine during some part of a trip planning process because I love Kayak’s search preferences. So I’ve put together my favorite travel hacks that you can use on on Kayak flight, hotel, and rental car searches. Kayak’s customization search bar is awesome, through TripAdvisor recently launched an aggregator that has pretty nifty search preferences as well (it may even top it). The following tips show you how adjusting search preferences (on any travel search engine) will save you thousands of dollars. Ensure that your flight departure/return times allow you to take public transportation (or is at an hour where a friend/family member can pick you up). If your flight is leaving at 7 am out of Washington-Reagan Airport, the Metro won’t be open early enough for you to take it — resulting in a hefty cab fare. Check the “Red Eye/Overnight Flights” box to search for overnight flights. While red eye flights aren’t the most enjoyable for sleeping, that $75-$200 you’ll save in hotel costs will be nice. Frequently nearby airports turn up cheaper fares. Make sure you include them by checking the appropriate box when you search for your flight. 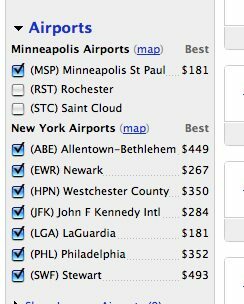 For example, in a recent search I would save $103 by flying into LaGuardia instead of JFK in New York. Newark was $20 cheaper than JFK. 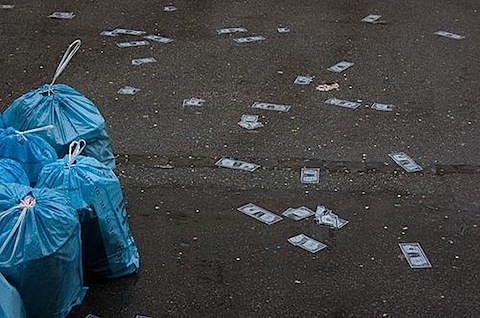 Taxes and fees add up — even though Orbitz, Expedia, et al recently suspended some fees. Kayak automatically includes these, so there should be no surprises when you click through to buy. TripAdvisor includes these in their search results. Kayak has a nice summary that’s frequently updated. You can save anywhere from $15-$200 depending on number of checked bags, snacks and drinks, and pet fees by carefully comparing airlines’ fees. If you’re in town for a convention, wedding, to visit relatives, or any other event where you’ll be frequenting one place more than most, choose a hotel near that location. Kayak allows you to enter an address, or choose from a landmark, to search for a hotel nearby. Choosing a hotel with a free airport shuttle can easily save $10-$50, and you’ll avoid the hassle of a cab or rental car. Search for a hotel with a free fitness center to avoid shelling out extra cash to use the treadmill. Savings: $10-$15/day. Find hotels with internet, then narrow it down to find free internet to save $5-$15/day. If you’re renting a car or driving, you’ll save up to $40/day (depending on the city) by finding a hotel with free or reasonably priced parking. Bonus: In this economy, give the hotel a call and negotiate for free parking if they don’t already offer it. Save money and the environment when you choose a car with better gas mileage. If you’re driving a really long way (like Minneapolis to Chicago), check the unlimited miles box to save a ton (up to $0.89/mile). Here’s some information that’s good to know about using travel coupons and codes and discounts on traveling. Some online travel sites offer coupon codes for a certain dollar amount off. For instance, there are numerous online travel booking sites that will give you a $10 or $15 discount with a coupon code. It doesn’t matter if you spend $100 or $10,000 the discount will still be the same set price. Most car rental coupon codes come with a percent discount. Occasionally you may find cruise coupons with a percent discount, but the majority of the time only car rental companies offer a percent discount. Many of the “travel coupons” you’ll find will actually be a package deal discount. Though they are frequently referred to as percentage discounts. This means that by renting a car, booking airfare, and hotel all with the same agency you are saving money. It’s not quite the same thing as a coupon, since it’s usually offered to everyone visiting that site, but these can still sometimes be a good deal. More frequently, however, you’ll find a travel coupon offered on a package deal – then you really may be looking at a bargain. Again, this isn’t technically a discount, but look for sites that offer no booking fees as you’ll save money. Before we start posting travel coupons, I want to make it perfectly clear that sometimes coupons don’t mean a good deal. Some companies and online travel agencies have a higher base price to start with, or add extra fees – so even with a coupon code the bottom line isn’t all that great. It would be like using a coupon for an item at a gourmet grocery store – you might have been better off shopping without a coupon at the discount supermarket. Please beware when using travel coupons and continue to be a contentious consumer. The best travel coupons are the ones that you can use. If you aren’t taking a discount international flight with Vayama, then there’s no point using a coupon with them. If you know where you’re going or what company you’re booking with, click here for coupons and travel discounts that specifically match your needs. But, if you’re flexible with where to travel, then you may get an amazing deal with any variety of coupons. Another great place to find discount travel codes is by subscribing to the newsletters of online travel agencies you frequently use. Lastly, one of my favorite places to get coupon codes (Travel and otherwise) is on RetailMeNot. Consumers submit codes and then vote on whether or not certain codes worked for them. You can (almost) always cancel your hotel 24-48 hours before you are scheduled to stay there. This means that if the hotel room price drops or you find a cheaper room at a different hotel, you can cancel and rebook for the cheaper price. As soon as you know your trip dates, search an aggregator like Kayak (you can click on Kayak to also search Orbitz, Expedia, and Travelocity at the same time). Sort through the results to find a hotel that meets your needs for dates, location, and price. Sometimes hotel websites will list additional specials or codes (like AAA discount codes) that you can’t always find on the aggregators. Read the fine print to be sure that you can cancel your room and note when you must cancel. Book the hotel room directly with the hotel, assuming they give you the best price. With an online travel tool, you can track the price of a hotel. Once you’ve chosen your hotel, sign-in to Yapta and start tracking the hotel price. Yapta will then alert you if the price drops. If it drops, call the hotel to see if they’ll lower your specific room price (this is easiest). If not, book with the cheaper priced room and then cancel your original room booking. Generally hotel rates don’t fluctuate as much or as often as airline ticket prices do. But when they do drop, it’s easy to cancel and get the better deal. Travel coupons and codes aren’t always the easiest to find, especially ones that aren’t expired. But it’s worth it as travel is expensive. Even a small percentage off is worth using. Here’s great 7 Tips for Finding Last Minute Travel Deals. Note: We only recommend products we’ve tried out and liked. We do link through affiliate links when they are available. We are not compensated to provide opinion on products, services, websites, or other topics. We will only recommend products or services that we believe, based on our experience, are worthy of endorsement. Read our full policies page. In recent decades, the only way to research flights and airline prices was through a travel agency. Now, the Internet enables anyone to prepare their own itinerary, so why use a travel agent? There are lots of reasons to use a travel agency. I definitely consider myself a do-it-yourself traveler, especially international travel. I’m on track to visit 30 countries by my 30th birthday. So people are surprised when I tell them that I sometimes use a travel agent. Of course, there are times when I opt to book my own travel. For example, we’re visiting friends in Orlando soon, and I bought the tickets online directly through the airline. If you’re taking a trip within the United States, I suggest using a website like Expedia or Priceline to buy the tickets instead of going through a travel agent. By all means, book away. So why use a travel agent? If you are going on a more complicated trip — maybe long-term travel or a luxury eco-friendly vacation — a travel agent can be a great resource. An experienced travel agent will have the knowledge and connections that are helpful when planning expensive or long-term travel. They will know what airports to avoid and how much time you need between flights. Planning a trip to an unfamiliar destination? A travel agent can give you advice on what tour guide to hire, how much to pay, and what area of town you’ll want to stay in. Travel agents stay up-to-date on latest hotel openings, new nonstop flights routes, and travel deals. In addition to having more information than the rest of us, travel agents also have more access to people and resources that will make your trip go smoothly. We had some luggage issues on our honeymoon in Greece. On the last day of our honeymoon, rather than lounging on the beach, I was camped out the lobby of the hotel trying to talk to the airline. Then it dawned on me that I could call our travel agent for help. One quick call later, he was talking the airline and resolving our luggage problem. Travel agents also have access to locals and maintain relationships with them. If you’re going to a foreign country where English is not the first language, an English-speaking guide will be very much appreciated. A travel agent will be able to suggest guides that not only speak English, but will be a match for your needs and interests. It sure beats scrambling to find someone once you get to your destination. There is a common misconception that a travel agent is a luxury that most of us can’t afford. But the truth is, a good travel agent can actually save you money. Often, for international flights, our travel agent comes in with prices lower than we’d get booking directly through the airline — this is especially true when we’re doing a flexible flight search. Sometimes the financial savings comes in when we’re able to avoid cancellation or change ticket fees. When my husband and I got married, we were living in South Africa. I was hoping to get my new passport from the South African Embassy in Cape Town, but I ended up having to renew it on a short trip back to America. I was planning on just carrying all of the documentation (old passport, new passport, and marriage license) on my flight home. However, when I went to the passport agency to get my new passport in my married name, they informed me that the airline probably would not let me board the flight since it was booked in my maiden name. Since our travel agent booked the flight for us, I was able to call her immediately. While we waited at the passport agency, she made a few phone calls to sort out the situation. She called me back in 30 minutes to tell me that she had worked with the airline to change the name on my plane ticket, and even convinced the airline to waive any fees. It was great to know that she was on our side, advocating for us and saving us money. There are definitely trips that are all about the adventure — the mishaps and hiccups along the way are part of the fun. But then are the trips where you want to do everything you can to make sure your vacation goes as planned. Maybe it’s a trip you’ve been saving for or a vacation to celebrate an anniversary. That’s where a travel agent comes in. For a lot of us, a trip to Australia or an African safari are once-in-a-lifetime experiences. An experienced travel agent will make sure that your trip goes smoothly, and that your travel investment is protected. There are so many advantages to using a travel agent that you might only realize when a problem arises. You will be glad you have one on your side. How to Find Cheap Airline Tickets, the ultimate guide to saving money on plane travel. Will help you save time and your hard-earned money every time you buy a plane ticket. If you’ve traveled lately, you know that plane ticket prices are all over the place. 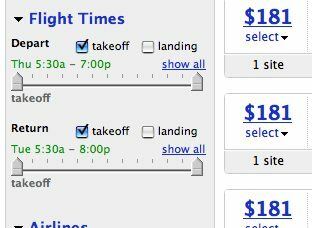 One day an airline will promote a huge sale, but then the next day ticket prices are even lower. Then the day after that ticket prices jump to three times the price they were two days ago. Add to this is the enormous number of airfare search engines on the web today. Should you use Kayak or CheapTickets or Expedia or NewestGreatestAirfareSearch? How do you know if you’re getting the best ticket price? Should you search all of them or just one? What if you buy a ticket and the price drops the next day? What if you buy a ticket and the price drops by half a week later? How do you know what a good price is? All of these issues make searching for airfare complicated. But what if there was a way to stay organized and save money? Note: For a free Cheat Sheet of the best search engines to use for nonstop flights, check out Find Cheap Airline Tickets Cheat Sheet, which I highly recommend and the Flexible Travel: Best Airlines Search. We know you’re busy and don’t have time to waste scouring countless search engines trying to keep track of the cheapest airline ticket that meets your time table. We’ve been there: backtracking and hunting. It’s time-consuming and frustrating. There are a lot of websites and informational products out there that tell you that XYZ Travel Search is the absolute best travel search engine. In reality, there are dozens of great travel sites. And many are the “best” at something, depending on your needs. Are you looking for a flight that leaves tomorrow, or any time next month? To a particular destination, or just somewhere with a beach? Depending on what you’re looking for, different tools will help you find the cheapest ticket. If you like buying first class tickets, won’t be able to help you. We can help to find the cheapest tickets every time, which are usually in the main cabin. If you are a frequent business traveler, and buy all of your airline tickets with miles, you aren’t going to benefit from this guide. More than just about anything else in the world, I love exploring new countries, tasting new foods, and experiencing new cultures. But I do nonprofit work and am getting ready to go to law school in the fall, so I don’t have a lot of money to waste. For me, a top priority is affordable travel, and I want all travelers to feel like they can take the trips they love. While flying isn’t the greenest way to get around, we advocate simple steps you can take to travel greener (learn more about our mission) — even when you’re flying. But eco travel isn’t just about transportation; a big part of green travel is exploring other cultures, foods, and economies. And most people choose to explore these other cultures while on a vacation that includes a plane ride. I think a big reason people don’t travel and learn about other cultures is because they think it’s more expensive than it is. I wrote this ebook because I want to help others experience new cultures and foods, and because I want travel to be financially feasible for everyone. A large piece to Find Cheap Airline Tickets is showing you a system — not just throwing a bunch of links at you. Too often I have lost money and time because I have spent hours searching for cheap tickets. I would search one day, then decide not to buy; then I search the next day, and maybe a week later, and then would miss a good deal because I waited too long or didn’t stay organized. Then one day I realized finding cheap tickets doesn’t have to be arduous. So I created this process for myself, in order to save myself time, money, and honestly a ton of hassle. Honestly, it drives me crazy when people pay booking fees when they could have booked for free. I want you to have more money to spend on food, souvenirs, and activities when you’re actually in a place. Save money on your ticket, and you’ll have more funds once you’re there. Just to summarize: I don’t want you to waste your time and money. Waste of any kind is not good for our environment. I’m sure someone somewhere can prove that when you save dollars and when you save time you’re really saving the Earth. We’ve provided free content here at Go Green Travel Green since 2008 and will continue to do so. Why are you encouraging flying on a so-called ‘green travel’ site? @Dave — Thanks for the feedback. We actually have a post for Thursday about this issue. We don’t advocate flying all the time – but unfortunately it’s sometimes necessary. We believe that people should get out there and explore the world because this cultural exposure is part of being a green traveler. It’s a great list. I want to share it with my ‘seniors’ who always looking for less expensive ways of traveling. Seriously? “People often ask” you? Let’s be honest here. How about “someone asked me once”, or even more realistically, “I like to imagine that someone might ask me someday”. @ Bud well considering the author writes for a webpage on travel, I dont think it is out of the realm of possibility that she gets asked that question quite often. @ Bud – Not really sure exactly what you’re problem was with that statement. As I’m sure most other travel writers do, we get a lot of emails asking about our favorite travel search engines. @Becky – Thanks for the suggestion about AirNinja. I’ll check it out! wao whats great suggestation. Thanku very much for sharing. Nice list. Even helpfull for a travel agent to get nice deals for their guests. Thank you for the list. This is really good resource for those looking for cheap flights tickets for any destination. thank you.its good for the who are roaming for cheapest tickets. what a good offer.thank you. Ya, This is good way to get cheapest and cheapest, I suggest to you all. If you want to know about Nepal you have to log on this site or you can call too. yes, I have seen it, it is really cheap and best. Tell me please, DO YOU KNOW ABOUT NEPAL? Thank you for the great information! I have some free domestic tickets so can fly out from anywhere. Is there a way to search websites showing only the final international destination and find out which domestic city is cheapest to fly out of? Fabulous article with useful info – Ultimate List of Cheap Airline Ticket Search Engines. Thanks to GoGreenTravel for this one. Great Post, your words are really true. It helped me a lot and I hope it will help others too. I found a really great service that provides airport meet and greet services for parking your car when I went on a trip to Hong Kong. It’s provided by yQ Now. It was great being able to drive right up to my terminal and have a member of staff go park my car for me. They also met me off the plane when I arrived and fast tracked me through customs, which really made my trip through the airport alot better than usual. It is so informative article. I got new information in it that is why i have stumbled it. Besoin de credit rapide, de credit bail et crédit bail , demande de crdit rapide, le crédit bail et de trouver les meilleures affaires du au taux le plus bas au financeimmo. It is so informative article. Nepal Environmental Trekking, Best Trekking agency in Nepal. Great .That is one huge memorial ! It IS different from all,Thanks a lot for the post. Im a massive fan of the blog,I’m reading every word here. I’m all about Kayak nowadays. I never understood why they named the website kayak (I guess something to do with comparing rates side by side like people in a kayak ride side by side) but it’s really helpful, especially if you travel a lot. Thanks for the helpful cheat sheet, I just used it to book my cousin’s flight! Hi Elizabeth, actually right, cheap airline ticket can not be found by search engine. It depends on our destination where we want to go. I am always looking for cheap flights, I will give these tips a go and see if it works for me.